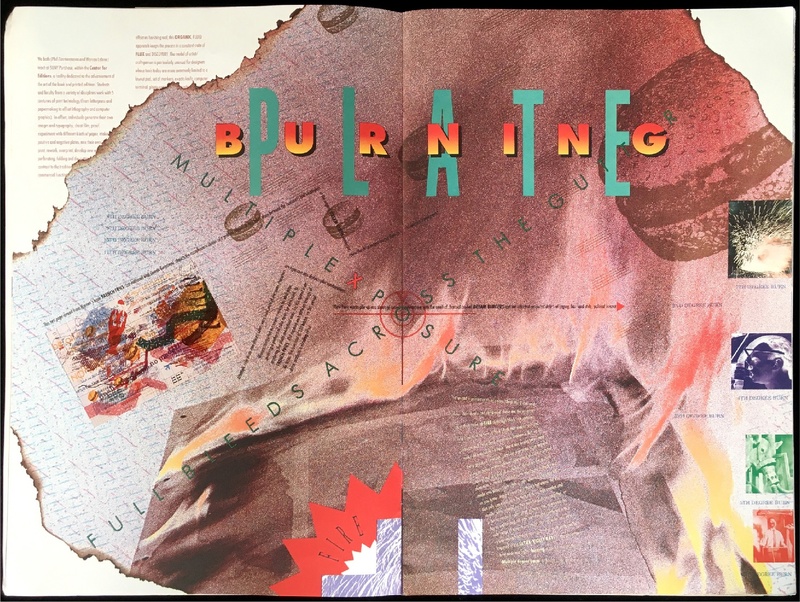 From 1984 until 2005, Rudy VanderLans and Zuzana Licko published Emigre Magazine, which featured typefaces from their Emigre foundry, but also created a vibrant platform for and discourse on contemporary graphic design, experimental typography, and design authorship. 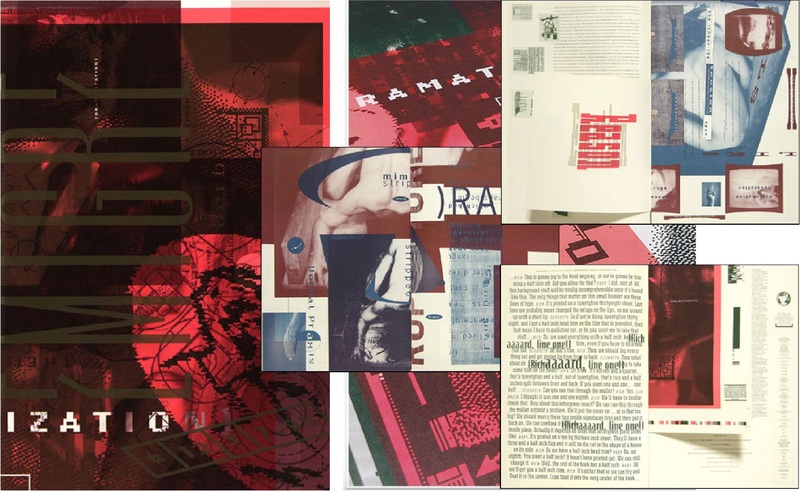 Emigre 11, published in 1989, was “devoted entirely to the initial response by the world of graphic design to the introduction of the Macintosh computer.” Interviews included: Philippe Apeloig, Jeffery Keedy, Takenobu Igarashi, Gerard Hadders, Max Kisman, Rick Valicenti, Clement Mok, Erik Spiekermann and others. For Emigre 12: Press Time, Warren Lehrer and a few other designers who use a hands-on approach to printing in their work were asked to contribute original visual essays. In turn, Lehrer asked his friend and SUNY Purchase colleague Philip Zimmermann to collaborate with him. Zimmermann is a pioneer of photo-mechanical reproduction techniques for artists, and an innovative and important book artist himself. Zimmermann also did all the photo-mechanical pre-press work on a number of Lehrer’s books including French Fries, i mean you know, and GRRRHHHH. 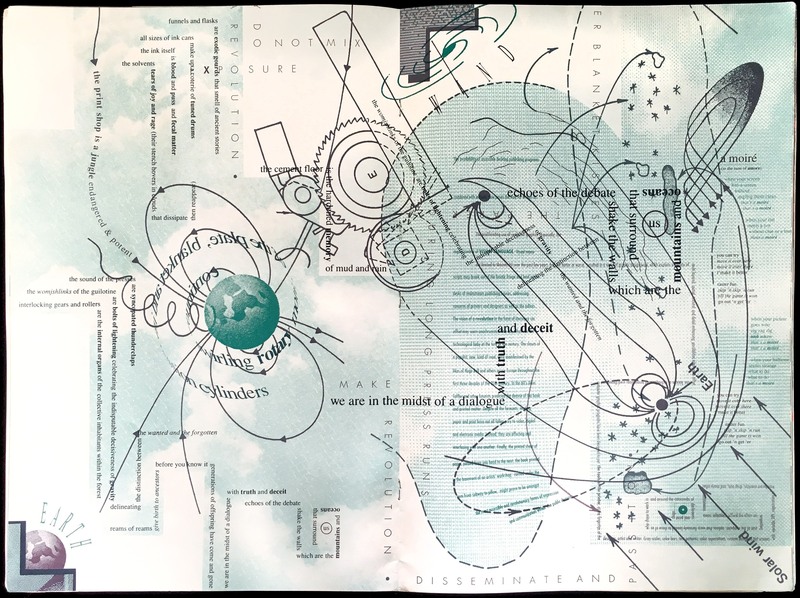 Lehrer considers these densely layered, maze-like pages the end of an era in his work. The approach to his visual literature in the 1980s was a true reflection/map of the way he experienced the world. It also laid the foundation for the work yet to come, which in many ways grew deeper in its relationship to the people and issues represented, and to the relationship between writer and reader. Lehrer is glad to have played a part in Emgire, a platform for discussion, debate, and experimental fervor that remains unrivaled to this day. 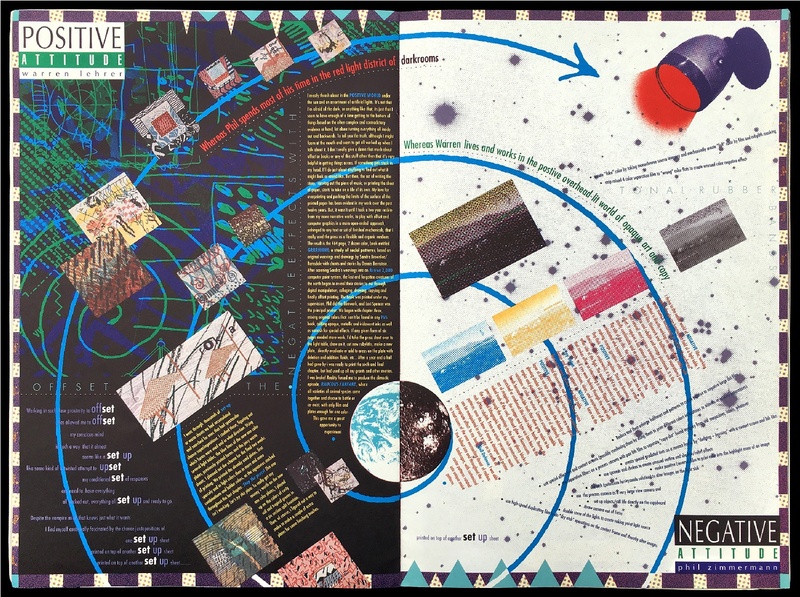 Emigré 12, Press Time 1989, Eight page visual essay written and designed by Warren Lehrer and Philip Zimmermann. 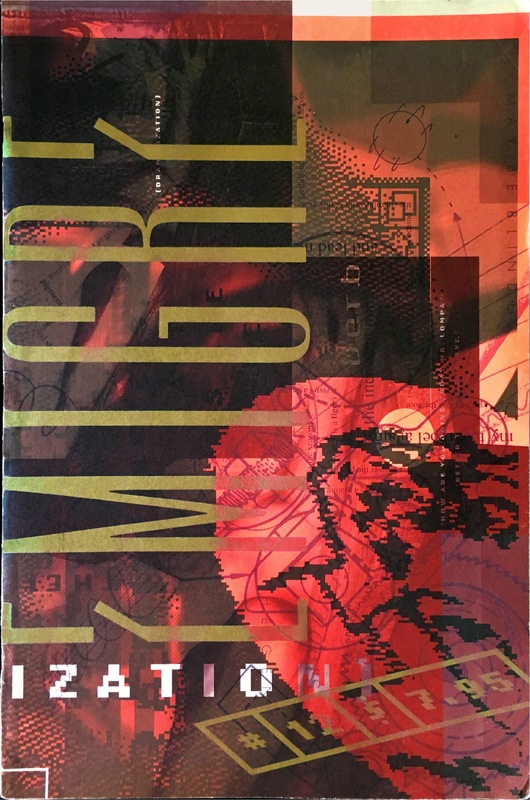 This issue of Emigre Magazine was devoted “to the art of pre-press and printing, featuring the work of graphic designers who utilize these disciplines as an integral part of the design process.” The issue included visual essays and poster designs by Allen Hori, Rudy VanderLans, and Warren Lehrer and Phil Zimmermann. It also included an essay by Ed McDonald about the life and work of H.N. Werkman, and a letterpress printed insert by Julie Holcomb. 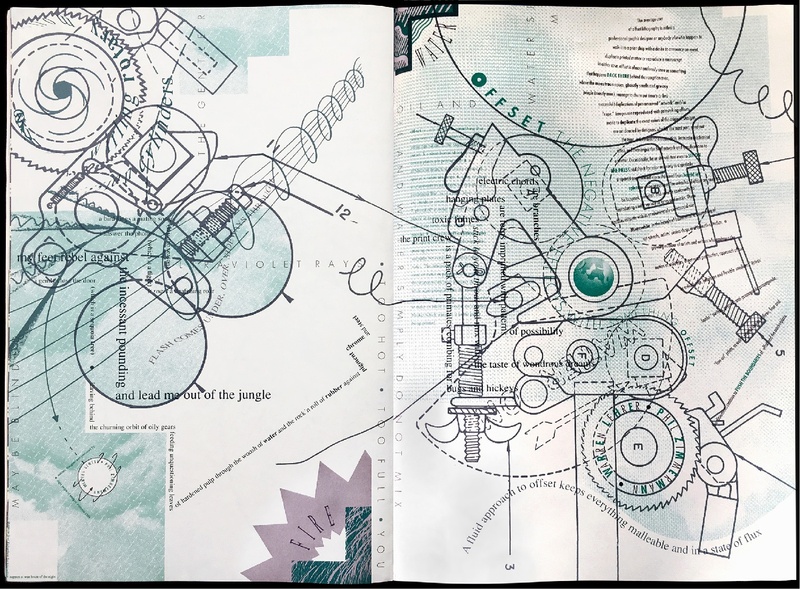 Lehrer and Zimmermann’s essay and poster discusses the process of working in a fluid, hands-on approach to writing/designing and printing. It equates the mix of oil and water, and rotation of inky rollers inherent to offset lithography—to basic elements of nature, and to the revolution of the earth on its axis and orbit around the sun. It also compared Lehrer’s process working in the light of day with Zimmermann’s process (at the time) working in the darkroom. Sold Out. You might be able to find collectors somewhere.